In "Clarify Your Brand and Use It," The Green Sheet, Feb. 8, 2010, issue 10:02:01, I defined brand as the promise of value your company delivers to its customers and the marketplace. I also discussed how to use brand to your company's best advantage with a key element being to have a relevant and compelling value proposition. This article delves into the mechanics of developing such a value proposition. Value propositions are important because they provide the rationale for customers to choose to do business with you instead of the competition. A value proposition should tell prospective customers - in a short, to the point and convincing way - why they need your product or service and your company. Having a relevant and compelling value proposition is especially important in the payment processing business, as it can elevate your company from the sea of competitors offering what is often perceived as a commodity service. Without a need and competitive differentiation, customers have no incentive to buy from you, and without sales, your business cannot survive. Your brand's value proposition is a combination of the functional (tangible) and emotional (intangible) benefits that matter most to your customers. Functional benefits are the real-world outcomes of choosing your company and its products and services, like saving time and money; emotional benefits are the ability of your company and its offerings to make your customers feel something, like safety and security. Understanding how your customers and the marketplace benefit from your products and services is the key to creating a successful value proposition. You must understand, then define and communicate why your company and its people, products and services are valuable to successfully compete and truly gain competitive advantage. 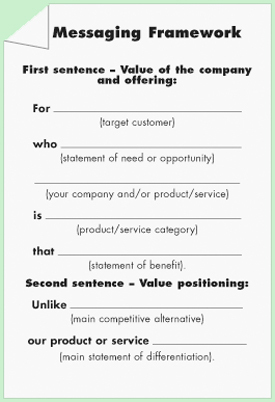 So what is your company's value proposition and what are the value propositions of your products and services? If you can't explain this in one to three easy-to-understand sentences, your value proposition is either ineffective or you really don't have one. Define the markets and audiences you are creating value propositions for. Remember, there can be several types of audiences such as businesses, consumers, employees, partners and suppliers. Identify your audience's business needs and challenges or problems to be solved and understand what they value. It's important to get real-world feedback rather than guessing to get this right. Describe your company and its products and services, explaining what you do and how you do it. Document the unique abilities you have to assist buyers with their business challenges identified in step two. Identify three to four core competencies that provide enduring value to your buyers. Define the impact and value of using your products and services and doing business with your company. Ask your customers whether you help them increase revenue or profitability; decrease costs; respond better to business opportunities and threats; improve quality, productivity or speed to market; enhance customer acquisition, satisfaction and retention; improve employee morale; and so on. Don't just create a laundry list consisting of tangible features and benefits only. Recognize that sometimes the greatest value you deliver lies beyond the actual products or services you're selling. Therefore, to pinpoint true value, analyze intangible impacts such as business relationships, ease of doing business, company integrity and reputation, customer service, organizational responsiveness and reliability, company flexibility, and more. Determine the alternatives available in the marketplace and identify how you're uniquely different. Research the competition and understand what they are delivering. Identify what makes your company and its products and services stand out from the crowd. To really nail competitive differentiation, you must specify exactly how your products or services and company are superior to every alternative available to decision-makers, including the options of doing nothing or taking care of their needs in-house. Provide evidence or proof points that your company can do what you say. You must be able to back up a value proposition for it to be credible. Once you've compiled the information from these steps, the work of constructing a relevant and compelling value proposition can begin in earnest. For families who place a high value on education and want confidence that their children receive a top notch education, ABC Academy is a private independent school serving children preschool through eighth grade that combines the best of classical education with innovative teaching. Unlike public education, ABC Academy guides the learning process with personal education plans that nurture the academic, creative and physical development of each student to ensure they earn high test scores and are admitted to top college preparatory schools. Use the messaging framework accompanying this article to create your own succinct, one to two sentence value proposition. Avoid jargon that is likely to be unclear to recipients of your value proposition so you don't create confusion. You want everyone, even someone not familiar with your business, to be able to understand these facts about your company: who you are, what you do and the unique value you deliver. Once you develop a value proposition you feel comfortable with, test it inside your organization and in the marketplace to determine whether it resonates. Make sure you can defend your value proposition while ensuring it delivers on your brand promise. If you articulate your value proposition and your customers and employees agree it's true, then it works. If they respond "So what?" you need to go back to the drawing board. When you have a relevant and compelling value proposition in place, use it as the foundation that drives all communication from your business, both internal and external. Make sure you convey your value proposition consistently through all communication vehicles, channels and touch points so that it becomes ingrained, that is to say, second nature to your employees and acknowledged by your prospects and customers. To reiterate, a value proposition is vital because it provides the reasons and justification for doing business with your company over the competition. The consequence of not having a relevant and compelling value proposition is that your company is likely to just blend into the crowd of merchant service providers selling only on price, while the rewards of employing a value proposition can be significant in terms of both increased market share and profit.